Some Tweets hit too close to home. Some tweets backfire. Some tweets hit too close to home. For the record, I never did think Marc was a jerk, nor did he need to apologize... UNTIL NOW! 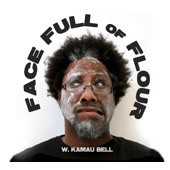 If you wanna hear my episode of WTF, you can get the WTF Pod app for your iPad or iPhone. Or you can go to WTFpod.com an dget it there. I think it costs money now... Because it was THAT good... also it was one of the first 50... before Marc went all Ira Glass/Carlos Mencia/Ray Ramano/Louis CK/Blaine Capatch on us. Here are my Top 5 picks for pretending like you planned ahead while still giving a thoughtful gift that comedy fans will completely love. Also, these downloads are a therapeutic way to get through holiday travel and long family gatherings. Go to Christine's Blog to see the rest of the Top 5! It includes Marc Maron, Paul F. Tompkins, Comedy Death Ray, & Jimmy Pardo. WTF Podcast with Marc Maron featuring me & Dwayne Kennedy. RACE-Y! WTF Podcast with Marc Maron So a couple weeks ago when I was in LA taping Marc Maron's TV Pilot for Comedy Central, me and Dwayne Kennedy also taped this episode of Marc Maron's WTF podcast. The interview is pretty much 100% focused on racism in alternative comedy... which makes it seem pretty topical considering all the John Mayer nonsense yesterday. This interview was sort of a surreal experience for me. I've been a big fan of Marc's since before I started doing comedy, and I'm a big fan of his podcast. Marc is credited as one of the founders(?) of Alt Comedy, but I've always appreciated him for his honesty, his blistering point of view, and his... I don't know how to put this... his ADULTHOOD. There are very few comics that feel like adults when they are onstage. Most comedians onstage feel like teenagers or college students on a Friday night, but Marc is part of a class of comedians who feel like adults. (including Greg Proops, Jake Johannsen, Bill Burr... and it goes without saying Bill Cosby and Paul Mooney) I've always respected that quality in a comedian and have aspired to be that myself. It doesn't mean they don't talk about or do silly things but they do these things from an adult perspective. It feels like it is a throwback to the 60's and early 70's era of comedy. The 2nd reason this episode felt surreal is that I was able to tape it with Dwayne Kennedy. Not only is he is one of my best friends but he is also one of my favorite comics of all-time. No exaggeration. He's a comedy legend amongst the people who know these things (Marc sort of goes into this at the beginning --- if they left that part in.) , and there's not enough evidence online for you to know how good Dwayne is. And DEFINITELY getting Dwayne to open up like he did on Marc's podcast AND ON THE RECORD is rare, so enjoy it while it lasts. I haven't listened yet to this episode, yet --- possibly because I was there. Check it out and let me know what you think. ENjoy this episode of Two Legends and Kamau. You can get it on Itunes or just click HERE!